Losing weight after 40 is not as hard as you think. STRENGTH TRAINING & FAST REPS are KEY COMPONENTS to achieving your fitness goals. Research shows that HOW you train can make a difference between average results and superior results that give you a faster metabolism to burn fat, blast calories to show off lean muscle. The secret is targeting a specific type of muscle fiber called FAST TWITCH MUSCLE FIBERS, that are responsible for bursts of speed and muscle power. This type of muscle is faster & denser, that may yield quicker results. The key is to train to fatigue. Dirty 30s will definitely fatigue your muscles. To ensure even more fast twitch muscle fibers are recruited, make sure to select a weight amount that is appx. 70% of your 1 rep max. My Dirty 30’s Method of Training incorporates BOTH STRENGTH TRAINING & FAST REPS, PLUS BOUTS OF CARDIO! (Dirty 30’s classes are available at Kiana’s eGym) This powerful Method helps you get lean, strong and boosts your metabolism all day so you burn more calories all day every when you’re sleeping. My Dirty 30’s Classes take it one step further by incorporating compound exercises that call upon multiple muscles, move at a fast pace hitting the fast twitch muscle fibers, all while alternating fat blasting cardio in 1 energizing 12 minute workout. I personally workout 3-5 times per week and do Dirty 30s at least once per week. These essential fibers, however, are the first to go as you get older (even if you’re active) because most workouts don’t target them. Fortunately, there’s an easy antidote: speed. Research from Salisbury University in Maryland found that lifting weights faster recruits more muscle and increases calorie burn by about 32%. That’s 72 extra calories per workout—the amount you’d burn walking a mile! Another KEY ELEMENT to losing fat, gaining lean muscle and staying motivated is to CHANGE UP YOUR WORKOUTS EACH AND EVERY TIME YOU TRAIN. I have made this super easy for you by providing 100s of Fitness Classes & Workouts in one convenient WORKOUT & EXERCISE LIBRARY. 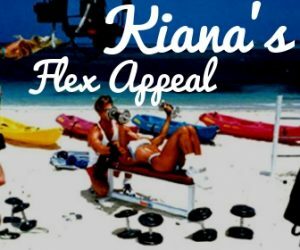 Check out Kiana’s eGym if you’re not already a member and join members worldwide getting super fit at home, gym or outdoors. Aloha! Have a healthy happy day! Access Dirty 30’s Workout Classes here or try this routine below. Note: In all Online Fitness Classes, I explain all exercises you will do for each workout so you know what to do. Options for beginners will also be explained. Set your interval timer for 12 minutes, 30 second intervals. Do each move for 30 seconds for a total of 12 minutes. No rest in-between sets. Beginners, no weight or small water bottles only. Intermediate / advanced fitness levels, add as much weight to make the last few reps super challenging. Goal: strict form, regulating breathing, max reps using proper form in 30 seconds. SQUAT PRESS: HOLD WEIGHTS IN EACH HAND. SHOULDERS BACK, CORE TIGHT, FEET HIP WIDTH. SLOWLY SQUAT DOWN, AS YOU STAND BACK UP CURL AND PRESS WEIGHTS OVER HEAD. PUSH UPS: SUPPORT YOUR BODY WITH STRAIGHT ARMS, HIPS DOWN, ELBOWS SLIGHTLY BENT. SLOWLY LOWER UNTIL CHEST IS 2-3 INCHES FROM FLOOT. EXHALE AS YOU PUSH UP. LOW JACKS: HANDS ON HIPS, SHOULDERS BACK AND DOWN. DO JUMPING JACKS WITH YOUR FEET ONLY, STAYING AS LOW AS POSSIBLE. EXTREME MOUNTAIN CLIMBERS: LIKE TRADITIONAL MTN CLIMBERS ONLY HARDER. TRY AND GET YOUR FOOT TO HAND LEVEL EACH TIME. Consult a physician before starting this or any exercise program.